Back in January 2018, Cycle Law Scotland’s founder and Senior Partner, Brenda Mitchell, had a bright idea. 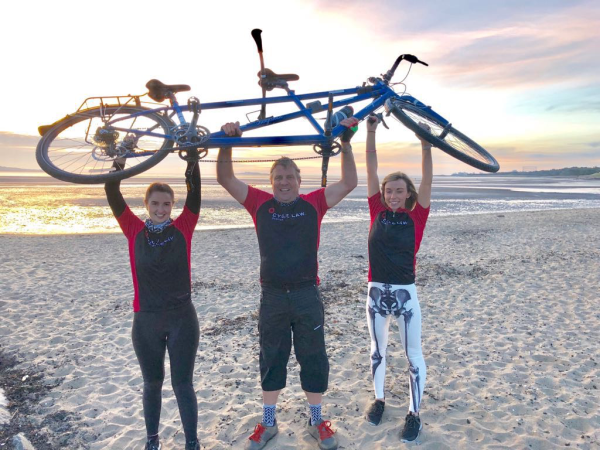 So, the Peebles based firm bought a large framed Ridgeback aluminium tandem and came up with a challenge to cycle 1,500 miles in a year and raise funds for SCAA (Scotland’s Charity Air Ambulance). Winter was harsh last year and the ‘Beast from the East’ put paid to cycling during March, so the challenge was reduced to 1,000 miles. For each mile notched up on the tandem, the firm agreed to donate £1 for SCAA. It may not seem that far, but if you work out how many lunchtime rides that equates to, then 100 rides averaging 10 miles per ride is quite a lot given everything else that goes on in a busy office. A final push which meant the tandem was out twice a day with different pilots and stokers enabled the team to reach their target by 30thNovember 2018 which was the end of RTALS’ financial year. A total of £1200 was raised which also included donations from clients and other supporters. “As a team we have learned a lot. On the tandem, success comes down to trust, teamwork and communication. It’s the same approach we adopt at work for all of our clients. “The tandem was ridden in various events including the Cycle Law Scotland Skinny Tweed, Ride to the Sun, Doddie’5 Ride for MND and the Tour o' the Borders. Most people are intrigued to see a tandem and it attracts a lot of attention. It moves pretty swiftly on the flat and can motor down the hills too. A speed of 51.3 mph down Paddy Slacks was achieved during Tour o’ the Borders which certainly tested the trust between stoker and pilot. If we’d been given a tenner every time someone shouted out, “that person on the back is not pedalling,” we would have raised even more funds to donate to support the excellent work SCAA do. SCAA is our nominated charity and we have been supporting the great work they do for a number of years. David Craig, Chief Executive of Scotland's Charity Air Ambulance (SCAA), expressed his gratitude to all those who cycled their way to success. "SCAA is hugely indebted to everyone who helped realise this tremendous total through the Cycle Law Scotland Tandem Challenge,” he said. "Raising charity funds while helping to stay fit and active is a great way for staff to get involved as a team and push themselves for a good cause. A fun active fundraiser such as the Tandem Challenge is a win-win situation for both those taking part and charities such as SCAA who are fortunate enough to benefit from the staff endeavours." Now to think of an activity challenge for the year ahead…watch this space!